Zombiegal Kawaii is a side-scrolling game for iOS (iPhone/iPad) that pits players against hordes of zombies that have taken over your hometown. There are other games that follow this same basic plot, but where Zombiegal Kawaii separates itself from the pack is through its unique character design and character audio. 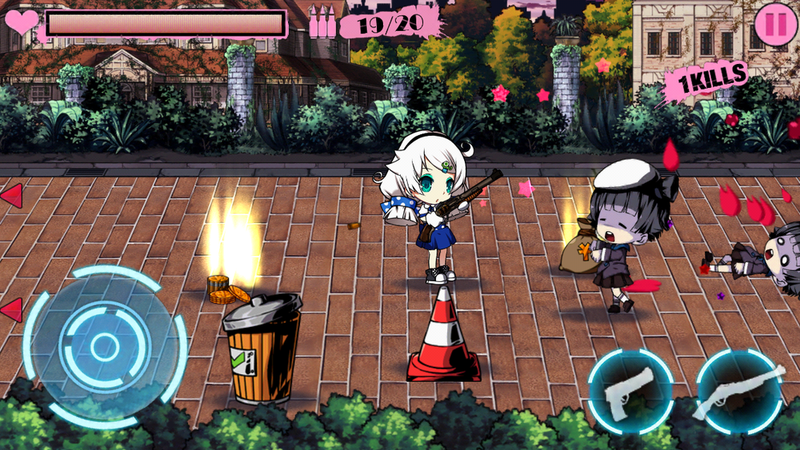 The main character is a gun-toting schoolgirl that is drawn chibi style. As the player plays the game, the girl will make some sort of context sensitive utterance (in a stereotypically syrupy sweet voice). If you pick up ammo, she will say 'yokatta wa (good)' . Picking up a health kit will elicit a 'daijoubu (I'm ok/not hurt)' . If you go on a bit of a rampage and get multiple kills in a row, she will exclaim 'shinde! shinde! (die! die!)'. These character quips, coupled with the fact that you are fighting chibi-zombie girls, make for fun and fast-paced gameplay. Zombiegal Kawaii is $0.99 in the App Store, but plays like a freemium game. I've previously written about how certain games have really missed the mark and others have done really well with integrating freemium aspects into the gameplay, and this game leans towards the latter. There is a 'energy meter' that limits how many levels you can play in any one sitting. This energy meter, of course, is intended to encourage you to pay for an in-app purchase that gives you more energy (and thus more play time). This game is best played in relatively short bursts, so this energy meter never really bothered me much (though I can see how it might bother folks who want to play more). As you progress through the game, your character gains experience and picks up money from fallen zombies. These can be spent in the 'store' screen where you can buy new guns or other kinds of weapons such as a baseball bat or katana. You can also purchase 'attribute enhancements' that impact character stats such as speed, accuracy, or counter-moves. Additionally, you can purchase outfits for your character. This brings up what is perhaps the biggest downside to the game--the somewhat sleazy way that the character is presented in some of the loading screens and the in-app store. Tapping an item that you don't have enough in-app currency to afford brings up a prompt to go to the shop to buy coins, which is punctuated with a picture of the main character in her underwear and in a suggestive pose (drawn in a much more realistic style than normally seen through gameplay). The juxtaposition of the cute, chibi-style and the sexualized versions of the character is odd, to say the least. Folks, Zombiegal Kawaii is a game that is worth a look. The touch controls work well, and the visual design and audio work is appealing. The art style may not appeal to everyone, but fans of anime and manga will find the style familiar and inviting. Tagged with iOS, iPhone, iPad, videogames, anime, zombies, kawaii. July 3, 2013 by DevWithTheHair DevWithTheHair.